This page is reserved for other miscellaneous police car pictures. What Seems to be the Problem, Officer? Above: On the morning of April 30th, 2006 I was headed to Baytown, Texas for a car show. A Texas DPS trooper saw my car on the trailer and stopped on me near New Caney, Texas on US-59 (not too far north of Houston). After a few minutes of getting acquainted and taking a couple of pictures I was released. 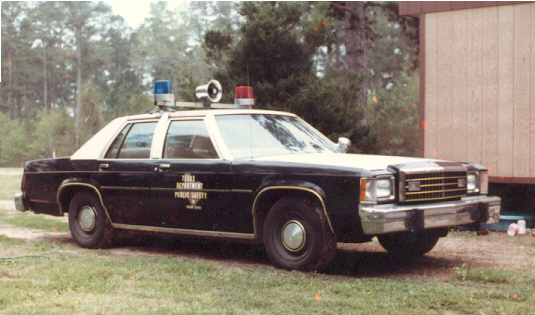 The 1981 Texas Highway Patrol Crown Victoria 4dr on the left was issued to Trooper Steve Sikes. This picture was made near Groveton in Trinity county....a long time ago! On the right, Trooper Tom Selman's old '86 DPS Mustang! Above: Texas Highway Patrol Troopers from across the state were called to aid the Beaumont area with hurricane Rita disaster efforts. Some of their duties included traffic control, riot and looting supression and general security. Several of the boys got together and posed with their patrol units at the local Academy store in Beaumont. Photographer: Unknown. Above Pictures: TAKES ONE TO CATCH ONE! Below: Trooper Kervin Largent, THP-Lufkin (right) and Corporal Harold Goggans, THP-Lufkin (left) pose for a quick snapshot shortly before going on-duty. Picture date: Sometime in summer of 1991. 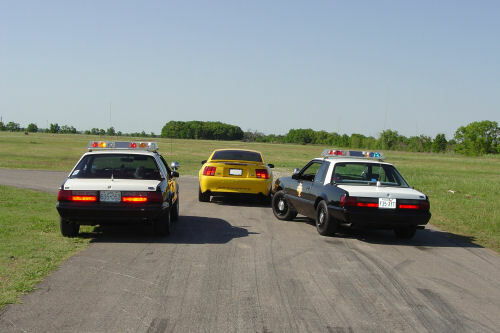 They are seen here with their 1990 Texas DPS Mustang. Harold decided to retire in 2002 and we wish him well! Above: Kervin's daughter, Lyndsey decided to get in the picture and steal some attention! Special thanks to Trooper Kervin Largent, THP-Lufkin for sharing these personal photographs. Above: A 1985 Texas Highway Patrol Ford Mustang is photographed going thru a skills & test track at Bergstrom Air Force Base in Austin. Remember the day of the "4-eyed" Mustangs! 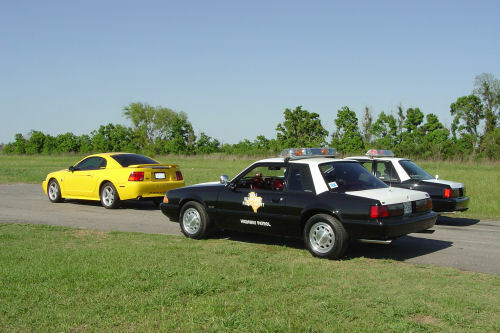 On the left is a 1985 Texas DPS Mustang and on the right is a cool-looking 1982 Mustang GT. Photo courtesy of D.L. Pruett. 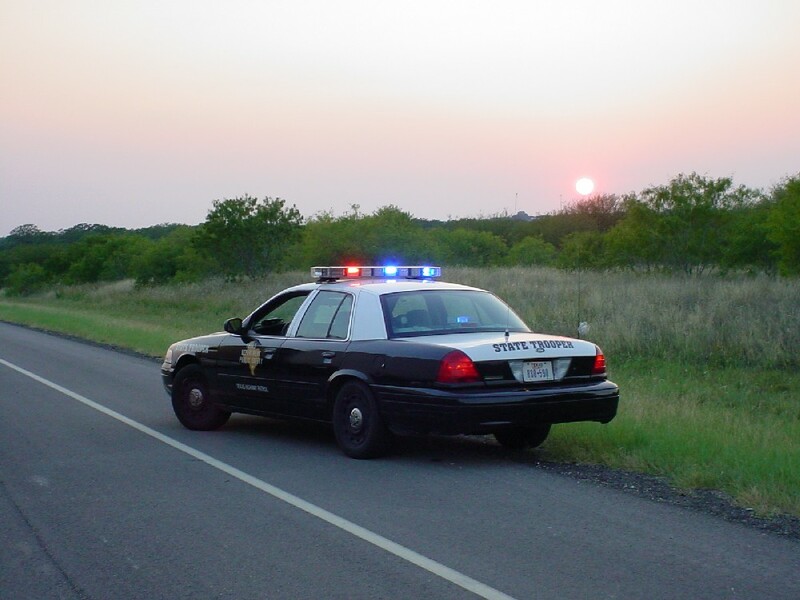 Above: The July sun sets over San Antonio, Texas as Trooper Michael Cantu, THP-Seguin snaps this quick photo of a 2006 Ford Interceptor used by the Texas Highway Patrol. Above: Top three pictures taken on September 20, 2006 at the Conroe Highway Patrol office in Conroe, Texas. Pictured is Sergeant S.J. Rayburn, THP-Conroe/East and the highway patrolmen under his command. 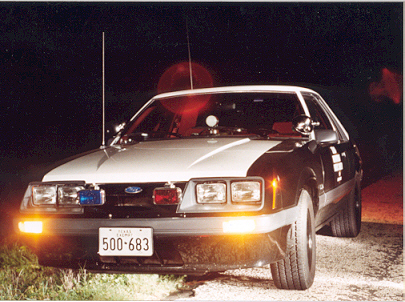 Bottom picture is of Roman's restored 1993 Texas DPS Mustang and a 2006 Ford Interceptor 4dr. Above: An old retired Texas DPS Mustang sits on the lot waiting for auction day. Photo courtesy of Tom Mallette. Above: An old Ford Taurus Texas Highway Patrol Unit. Unknown year model or date of picture. Location: Silsbee, Texas. Above: An old Ford LTD. Unknown year model. Photo courtesy of Trooper Don Plunkett, THP-Victoria. Above: SPY PHOTOS! These were shots taken by our contract spy agent. He couldn't gain access to the DPS Fleet Yard but was able to get a couple of shots of these BRAND NEW 1990 Texas DPS Ford Mustangs. They even still have the window stickers on them. In the background are some older (new then) Ford LTD's. Photo courtesy of Tom Mallette. Above: Old Texas DPS Mustangs waiting for auction day. These were probably 1987-1989 models. Photo courtesy of Tom Mallette. An entire row of approximately 50 retired Texas DPS Mustangs are waiting on auction day and to be taken home by new owners. 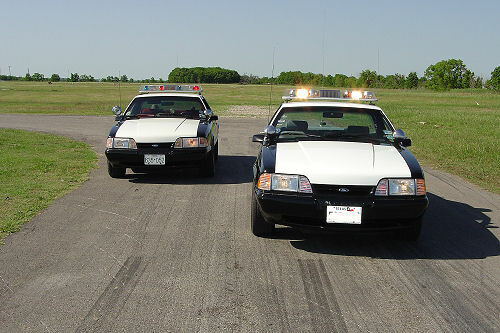 These are 1987-1989 models and are shown here behind the Texas DPS Fleet Operations Center in Austin, Texas. One must wonder where these fine old cars are now? Thanks again to Tom Mallette for sharing the pictures and helping make this web site worth seeing! 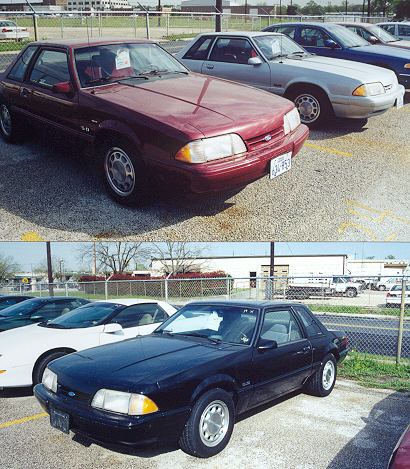 Above: A few old 1993 Texas DPS Mustangs are shown here prepped & painted and ready for auction day. Photo date: Spring 2000.